Teachers from Mexico’s CNTE union have pledged to increase their protest actions after the government arrested several of their leaders, including a call for a massive demonstration in Mexico City on Friday June 17. 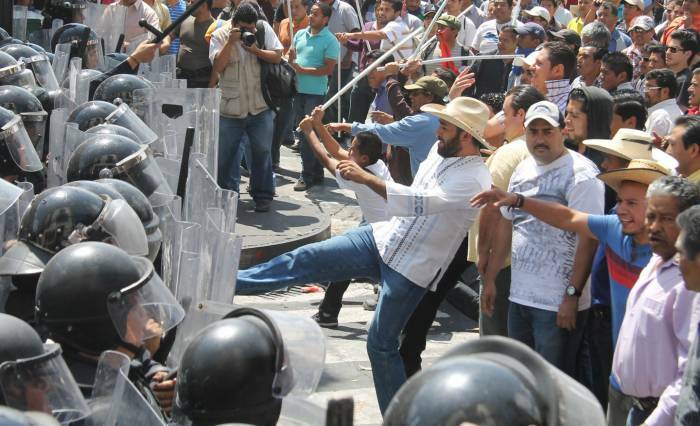 Meanwhile, Renato Sales Heredia, Mexico’s national security commissioner, stated Tuesday June 14 that the government will use force to repress mobilizations by striking teachers and their sympathizers. CNTE leaders announced they will be increasing their protest actions after the federal government arrested several of their officials on what the union considers to be spurious charges. In Mexico, common protest tactics include the shutdown of major highways or the staging of protest camps in front of government offices. The CNTE, which is presently on strike over the government’s education reforms, often employs these types of political actions. States where these tactics already have been employed include Oaxaca, Chiapas, Guerrero, Michoacan and others. Heredia said that a “moderate use of force” would be used to clear out these types of protests. He added that it would only be used as a “last resort,” but the Mexican government has been the subject of criticism by human rights groups for too often employing force against protests. Tensions between the CNTE and the government are exceptionally high after seven leaders were been detained over the past week. The CNTE considers those detained to be political prisoners. The union and its supporters say the arrests are a thinly veiled effort to weaken the union as it engages in mobilizations to challenge the government’s highly controversial education reform. The government has warned that there are outstanding arrest warrants for an additional 24 trade unionists. The timing of the arrests is raising suspicions that the arrests are indeed driven by an effort to silence critics. A government official said they have evidence suggesting irregularities in contracts signed by the CNTE in Oaxaca and alleged there was a kickback scheme in place to fund demonstrations by its members.